As promised I will post details every other day, on each page of this beautiful B-E-L-I-E-V-E Chipboard album featured on the Royal Blog Tour. Below is the front cover ("B") as well as the back of the "B", and then the front of the next page, the "E". 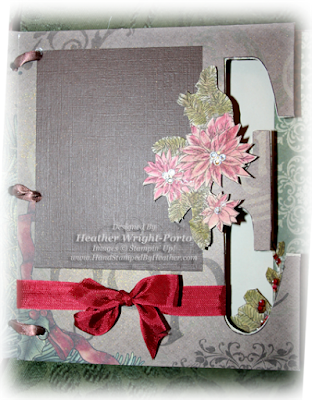 Again, this album is decorated using the Deck the Halls Designer Series Paper and the Bells and Boughs stamp set only (from the Holiday Mini). As noted previously, all poinsettia's in this album are filled with Jewels as the center, and all the berries are covered with Crystal Effects to add dimension and a cool, beautiful effect. On the cover, there is Gold Glow Smooch Spritz, as well as Rhinestone Jewels in the center of the poinsettia. 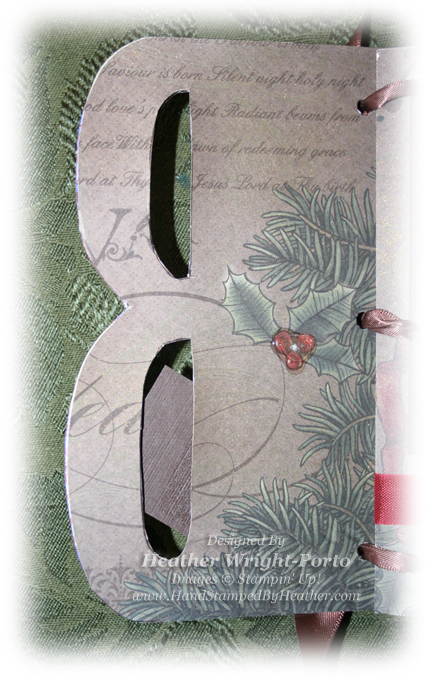 then the bells image was stamped in Early Espresso on Sahara Sand paper. 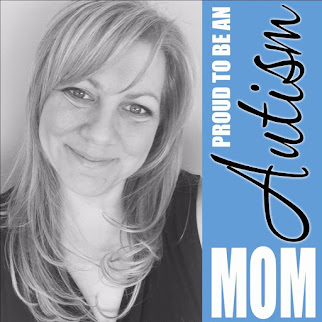 Then an Always Artichoke Stampin' Write Marker was used to outline the leaves. Then a Blender Pen and Old Olive Classic Ink were used to color the leaves (blending/watercolor). The ribbon was watercolored with Cherry Cobbler ink with a Blender Pen, as well as the Gold Ink and Blender Pen on the body of the bells. The berries have Crystal Effects on them to make them stand out and to add dimension. 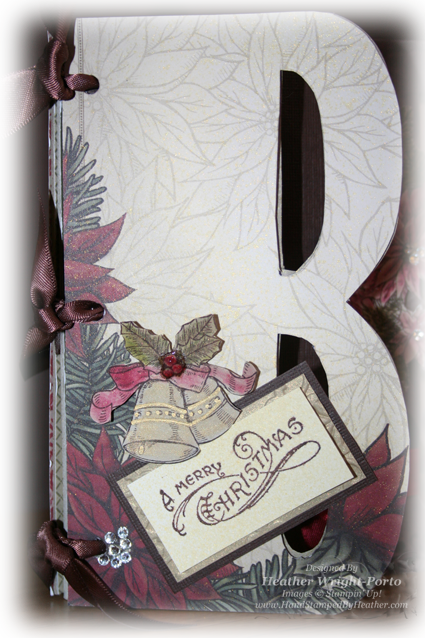 Lastly the Bells were adhered using Stampin' Dimensionals. The greeting was stamped on Very Vanilla cardstock that was sprayed with Gold Glow Smooch Spritz to give it a vintage look. Then it was mounted on a piece of Brushed Gold cardstock embossed with the Vintage Wallpaper Textured Impressions Folder. Then that mounted on Early Espresso textured cardstock. The greeting was adhered using SNAIL Adhesive. On the back side of the "B" there is nothing added but the Gold Glow Smooch Spritz and Crystal Effects on the berries on the actual Deck the Halls DSP paper. This front page of the letter "E" is first sprayed with Gold Glow Smooch Spritz. then a 3 x 3-1/2 piece of Early Espresso was adhered. A piece of Cherry Cobbler Seam Binding Ribbon was wrapped around the "E" and tied in a bow. It is beautiful, soft ribbon with shine! Last but not least, the poinsettias were stamped in Early Espresso on Sahara Sand cardstock and then colored using Stampin' Write Markers and a Blender Pen. All leaves were outlined in Always Artichoke Stampin' Write marker, and all Poinsettias were outlined with the Bravo Burgundy Stampin' Write Marker. Then the leaves colored with Old Olive Classic Ink and Blender Pen, and the Poinsettias colored with Cherry Cobbler Classic Ink and a Blender Pen. Then the beautiful BLING of the Jewels were added to the center of the poinsettia! More to come. 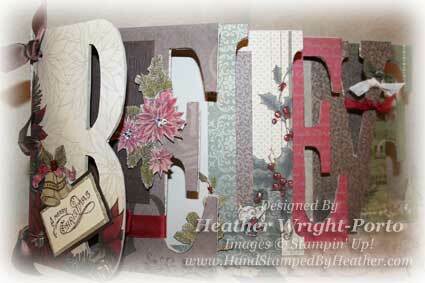 Remember I'll be posting every other day more on the B-E-L-I-E-V-E Chipboard project!